Sophomore engineering student Dirk Oyer received instant acclaim as he waved a small handheld wand in front of Harrisonburg High School students. “Hello, HHS,” flashed the blinking LED lights. “Wow!” “Genius!” “I want one!” came the feedback. 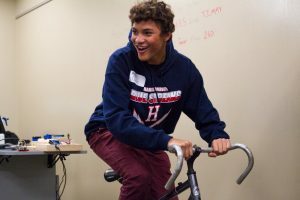 Harrisonburg High sophomore Charles McCarthy rides an energy-converting stationary bicycle during an engineering class at Eastern Mennonite University. Packed into a lab in the Suter Science Center, about 20 high school students were enjoying a showcase of projects created and programmed by engineering and computer science students. Soon, they’d be off across campus to another 30-minute mock class. The campus visit — which included opportunities to interact with college students, visit informally with faculty and staff, eat in the cafeteria and take a campus tour — was part of the Gaining Early Awareness and Readiness for Undergraduate Programs program, also known as GEAR UP. Harrisonburg High School (HHS) is one of 27 schools in Virginia to be awarded the U.S. Department of Education grant, designed to significantly increase the number of students who are prepared to enter and succeed in postsecondary education. Students learn more about the college application process and financial aid with admissions staff. HHS’s GEAR UP program was open to any student who signed up as an eighth-grader. Nearly 300 students joined the program three years ago. Members of the cohort will receive support through their first year of college. Tutoring, mentoring, parent activities and workshops on college readiness/financial aid are primary components. Forty-four high school students attended the day-long visit to EMU, said Lori Leaman, professor of education and co-director of EMU’s Honors Program. Leaman coordinated the visit with Honors Program co-director and history professor Mark Sawin; Matt Ruth, EMU admissions director; and grant site coordinator Rachel Linden, a counselor at HHS. 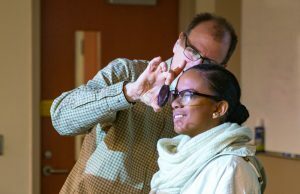 Professor Jerry Holsopple holds up a lens in front of Joana Bangeniguen. A unique twist paired high school students with 38 mentors from the Honors Program, the Latino Student Alliance, and the Student Government Association, said Leaman. The students stuck together through the day, building rapport and opening up channels for real conversations about college life and the students’ future plans. 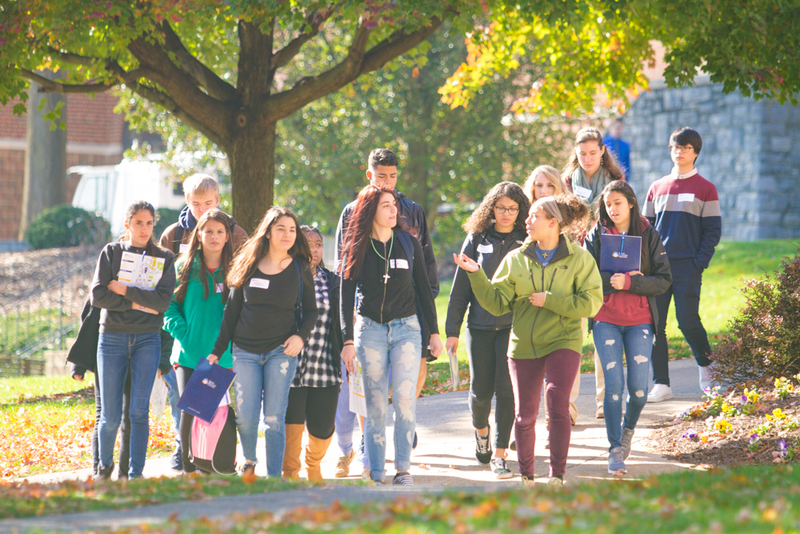 “Our goal was to give back to our Harrisonburg community in a way that made sense to our 10th graders: peer-peer conversation to encourage each of our young people to consider going to college, whether that be EMU or somewhere else,” Leaman said. “The day was truly collaborative, with students sharing their stories and our students, faculty and staff learning from them at the same time as they offered information. The interactions between the HHS students and our EMU students and staff were full of energy, with real questions about college peppering the supportive conversations throughout the day. Thirteen faculty opened their doors during “office hours” to speak with students, and three faculty, with seven student volunteers, offered short classes in education, photography and engineering to give the visitors an idea of what they might learn and explore in their future coursework. After lunch in the cafeteria, students chose special topics to investigate in informal, roundtable discussions with EMU coaches and various staff members about athletics and intramurals, financial aid, academic preparation and residence life. The campus visit hasn’t been the only chance EMU students have to meet with GEAR UP students. 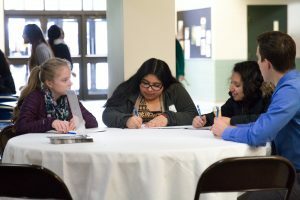 Several clubs, including the Psychology Club, Pre-Professional Health Sciences Club, and Student Education Organization have offered after-school activities and workshops.